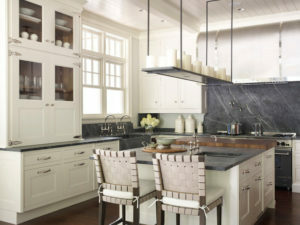 Soapstone is a durable and hardworking natural stone that is largely comprised of talc. 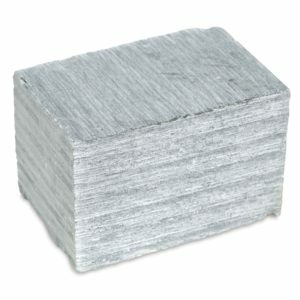 The talc is what gives soapstone its reputation of being “soft”. While it is true that soapstone is softer than granite or quartz, that is also part of its charm. Depending on the mineral content of a particular soapstone there can be somewhat minor differences in color. Some quarries yield subtle hues of green or blue, but the major component of talc will show light to medium gray. If a coat of mineral oil is applied, there will be a very dramatic transformation. 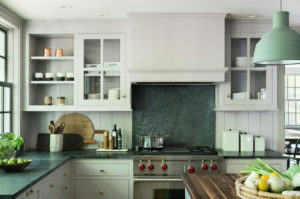 Whether oiled or not, soapstone compliments any kitchen color scheme. 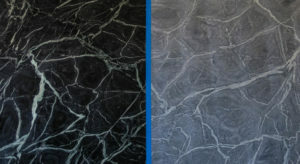 If you love the light veining of marble and the dark beauty of granite, consider soapstone. 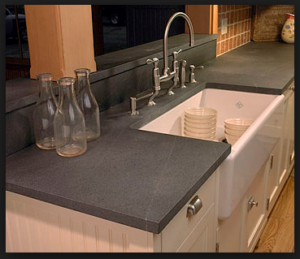 There’s a lot of misunderstanding about soapstone when in fact, it can be a wonderful countertop surface. Varieties range from very soft soapstone which can be used for purposes like carvings, to “hard” soapstone that is suitable for counters. Soapstone can scratch and/or chip, but that does not happen as often as some would suggest. Soapstone is non-porous, inert and does not stain. Soapstone does not need sealing. These traits make soapstone easy to clean. Mild soap detergent or just a hot damp cloth will be all you need, as bacteria won’t hold in microscopic pores, and you won’t be chasing fingerprints and smudges on its satin finish. You can leave soapstone as its natural color, or oil/wax it for cosmetic reasons. It comes down to personal preference. Oiling/waxing does not seal or protect the stone. Either way, eventually the stone will take on a darker patina in areas of the counter where it gets a little more use. Oiled soapstone can be a very forgiving material; it gives you the ability to hide most scratches just by rubbing some mineral oil on the affected area. Deeper scratches are removed with a light hand sanding and an application of mineral oil. For some owners, those scratches and dings are part of the allure and character of soapstone. Soapstone is “good” with both heat and water/humidity. Put all the hot pots and pans on it you can, soapstone loves the heat – and the cold! Place your frozen pizza dough on the counter right out of the freezer and it will generally be thawed in less than 45 minutes. Soapstone’s small slab sizes have little effect on kitchen layout and function due to the tight and barely visible seams that are possible. Slabs can be bonded with colored stone epoxy and sanded to create a product similar to fine wood joinery. In this sense, it gives us more freedom to create! There is no one countertop material that is perfect for everyone. Soapstone is durable, relatively low-maintenance, and has a lovely, old-world feel. With the right knowledge, you can expect to increase the durability and beauty of your kitchen; your countertop will outlast the home.